Gov. Henry D'Anvers is supposed to have been a very near relative of the Earl of Danby, who died in 1643. He was a soldier, who distinguished himself in wars in Holland, France, and Ireland. 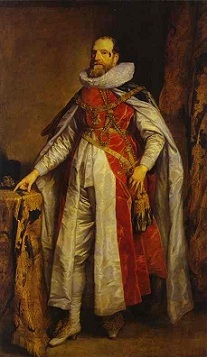 Henry D'Anvers was a colonel in the Parliamentary army. He was for a time governor of Stafford. He had such a reputation for integrity among the people over whom he exercised authority, that he was noted as one who would not take bribes. While governor of Stafford he adopted the sentiments of the Baptists, and notwithstanding his position, and the prejudices his baptism would stir up against him, he was immersed by Henry Hagger, the minister at Stafford at that time. After the return of Charles II. his situation was very critical; he was a man of prominence by his family connections, by the respectable estate which he owned, and by his military services. A proclamation was issued offering L100 for his arrest; he was seized at length and sent a prisoner to the Tower of London; but his wife had great influence in the court of King Charles, and he was released on bail. He was one of the ministers of a Baptist church near Aldgate, London. In this position he maintained a character so spotless that he greatly commended the truth which he proclaimed. Mr. D'Anvers was the author of a work which he called "Theopolis, or City of God," treating of the coming and personal reign of Christ in his millennial glory and triumphs. He also wrote a work on baptism, which was the ablest on the subject published by any Baptist till that time. It stirred up Richard Baxter most uncomfortably; and many others most slanderously. David Russen abused Mr. D'Anvers and his book with a vehemence which shows how powerfully he had been moved by it. He says that Mr. D'Anvers's book "is calculated for the meridian of Ignorance; that it is full of plagiary, prevarication, impertinencies, and manifold falsehoods; that no man of learning, but one who designedly (for an evil design) carries on a cause, will ever defile his fingers with such pitch; and that he should be ashamed to produce a book of that nature in a matter of controversy." But poor Mr. Russen defiled his own fingers with the work, and shows by his angry and slanderous words that Mr. D'Anvers had given him and other Pedobaptist sacramental warriors very heavy blows. The book, even in our own times, has been so highly esteemed that the Hanserd Knollys Society, a body representing the intelligence and learning of our English Baptist brethren, had resolved to publish it; and the Rev. William Henry Black was performing editorial labor upon it for that end, and only lack of funds hindered the publication. The same misfortune stopped the entire labors of the society.